A Recording Artist, Making a Splash Without a Sound? If Dori Hadar and George Hemphill have anything to do with it, Mingering Mike is finally going to be a star. "Mingering Mike" is the alias of a 56-year-old District man who, as a teen growing up in the late '60s and early '70s, imagined soul music stardom to the tune of 52 albums and twenty 45s. Each one of which he drew himself -- yes, drew -- in pen and ink on drugstore-bought construction paper. The records inside? Cardboard painted with grooves. He released solo albums, live albums, benefits and soundtracks to movies that never existed. Mingering Mike, in his creator's imagination, was sometimes joined with "Big D" or another backup partner. Mike had a prolific career, ups and downs included, entirely made-up. Mike's fantasy life is now on view in an exhibition at Hemphill Fine Arts, where almost his entire remaining oeuvre is on display. Without fate's intervention, we might never have known Mike. Years ago, he locked his cherished records in storage. Time passed, and he lapsed on his payments. The stuff was sold. Enter Dori Hadar. A record junkie who trolls flea markets, he found Mike's creations 3 1/2 years ago. (Full disclosure: Hadar is the son of Mary Hadar, this paper's writing coach and a former Style editor.) He then tracked Mike down at an address in Southeast Washington. They've since become friends and unlikely partners in the pursuit of Mike's fame. Sensing the star quality of Mike's handiwork, Hadar hooked up with gallerist George Hemphill in spring 2004, just months after discovering the cache. 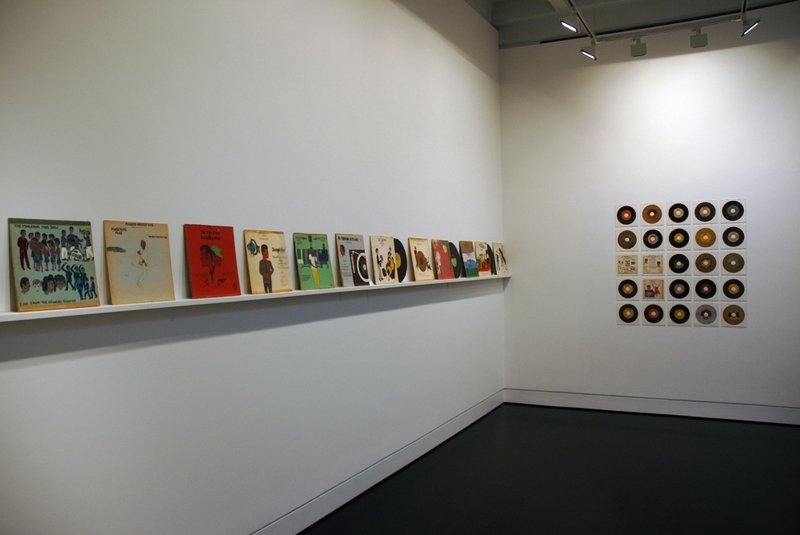 With Hemphill's help, the Southeastern Center for Contemporary Art, in Winston-Salem, N.C., held a limited exhibition of Mike's work, in early 2005. The show at Hemphill coincides with Princeton Architectural Press's publication of a book on Mike, written by Hadar. But who is Mike, really? He won't reveal his name -- not publicly, at least. (Although it's recently been reported elsewhere that his name is Mike Stevens, Hadar insists it ain't so.) Mike attended his opening in wraparound shades, a wig and a fake goatee. He claims to have two jobs and live in the District. He won't say much more. Mike left it to Hadar to broker the deal with Hemphill. As for profits from a sale, if that happens -- they're only willing to sell the collection in its entirety -- Hadar says that he and Mike will split proceeds 50-50. In many regards, the collection is a gem of personal history. At Hemphill, you can trace the arc of a career and a life. In the late '60s, when Mike was about 17, he "released" his first album, "Sit'tin by the Window," on "Mother Goose" records (a string of "labels" would sign him). A self-portrait of the would-be crooner, chin resting on fist in an awkward version of "The Thinker," adorns the cover. Mike continued like this for about eight years, producing nearly 50 records. The creator of Mingering Mike even recorded a few tapes of real music with second cousin Big D. Mattresses and phone books provided percussion. Mike's naive, illustrational style mimics the conventions of black music from the '50s and '60s. He's copied the trappings of Motown stars packaged for mostly white audiences -- think Dreamgirls, hand-drawn. Multiple vignettes share a single cover for a "live" album. Two hepcats in color-coordinated outfits lean up against a gold LP. Several covers occupy plastic sleeves just like LPs once did. But what sets Mike apart from the real superstars is that he cared. Berry Gordy would have nixed the jaundiced cover of "Sickle Cell Anemia," with its M. Mike-written track "Unfair Landlord." The producer would have halted song titles such as "Everybody's Goin Somewhere Except Me." While real-life black artists sang well-crafted ditties, Mike talked social issues. The cover Mike made after he got drafted for Vietnam and went AWOL shows the heads of a soldier and of a musician, positioned back to back. Below the faces hang two ghostly hands, one hovering near a microphone, the other near a machine gun. "Which one would you want him to grab for," reads the handwritten text. "One is for the better and the other is for the worst." Mike is what the art world likes to call an outsider or visionary artist. He had no training, musical or artistic, just obsessive desire. Think Henry Darger, who chronicled the antics of imagined prepubescent girls. Or local hero James Hampton, who created that foil-wrapped marvel, "The Throne of the Third Heaven of the Nations' Millennium General Assembly," found after his death in 1964. Hampton's 14-year project now occupies a custom niche at the Smithsonian American Art Museum -- yet Hampton never lived to see his success. With luck, Mike will know his own fame. Hadar would like to see the collection enter a museum, preferably a local one, though none has expressed interest. Right now, the task before Hemphill and Hadar is exposure; they hope to tour the work in the United States and Europe. After all, you can't be a renowned visionary artist if nobody knows about you.